Alex Schwartz had a promising future -- until he contracted an unfortunate bout of vampirism, and agreed (on pain of death) to join the Laundry, Britain's only counter-occult secret agency. His first assignment is in Leeds -- his old hometown. The thought of telling his parents that he's lost his old job, let alone them finding out about his 'condition', is causing Alex more anxiety than learning how to live as a vampire secret agent preparing to confront multiple apocalypses. His only saving grace is Cassie Brewer, a student appearing in the local Goth Festival, who flirts with him despite his awkward personality and massive amounts of sunblock. But Cassie has secrets of her own -- secrets that make Alex's night life seem positively normal . . .
First, a warning. For fans of Bob and Mo Howard, who are keen to catch up on them after their roller-coaster journey during the last two books -- you'll have to wait a bit longer to discover how they're doing. This installment is all about Alex, who we first met in The Rhesus Chart -- see my review here. While Alex doesn't have the dry wit of Bob, the story line soon whisked me up and held me as we have the Charles Stross version of elves making a dramatic appearance and like his version of vampires, they are far more lethally compelling and unpleasant than Tolkien suggests. I really enjoyed this break with the normal London setting, as Leeds is where Alex finds himself entangled in the latest incursion from another dimension in this smart fantasy/science fiction mash-up. Although I did miss Bob's dry, world-weary commentary, there are still some lovely touches of humor -- particularly enjoyable is Alex's meal with his parents as they reel under the combined onslaught of his apparent demotion, Cassie's oddness and his sister's bombshell. But the tone is a lot darker and those odd splashes of humor were very welcome in the final act, where there is chaos and mayhem in full measure. 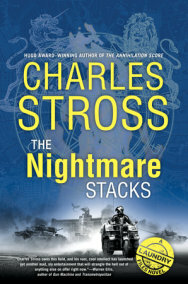 The battle scenes are full of drama and I found myself unable to put the book down as I needed to know what would happen next -- I wasn't sure that Alex would survive, for starters, as Stross is perfectly capable of mowing down a major character. I thoroughly enjoyed this one, though for me, it didn't have the emotional punch of The Annihilation Score which is my all-time favorite in this series, so far. However, there is plenty of compelling action and those elven warriors rampaging across the English countryside on lethal battle steeds, wielding magical weaponry will stay with me for a while.